1. 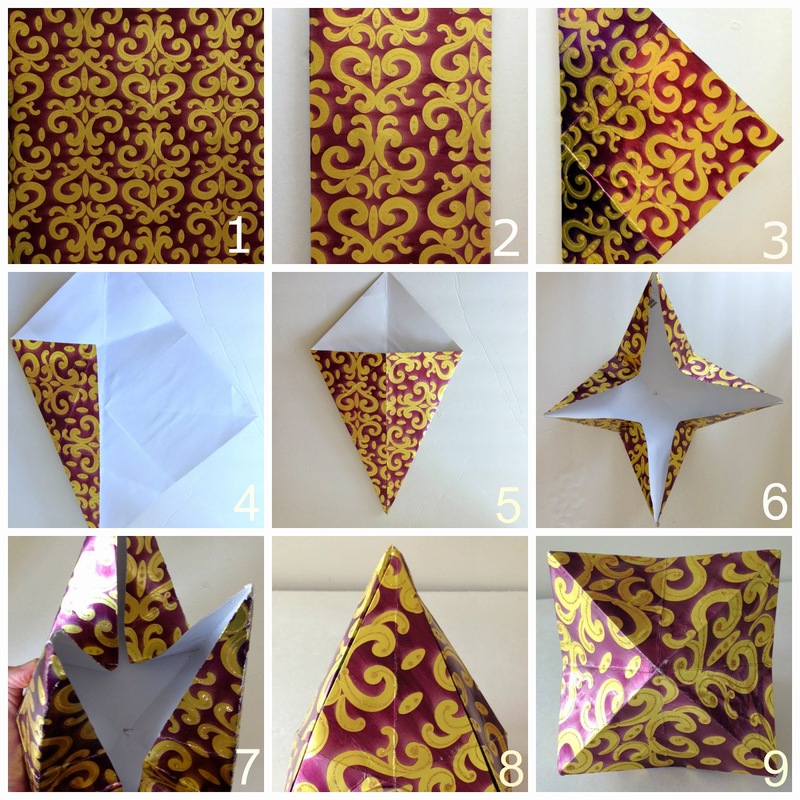 Cut the paper into a twelve inch square for a large ornament or for a smaller version, a six or eight inch square. 2. Fold (make crisp or sharp folds) the square in half, open and turn in opposite direction (ninety degrees) and fold again. Open square. 3. Fold diagonally into a triangle, matching corners. Open and turn in opposite direction (ninety degrees) and fold diagonally in half again. Open square. 4. Take a corner edge and meet the center crease line and fold. 5. 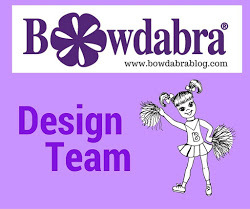 Take the opposite corner edge and meet the center crease line and fold creating a kite shape. 6. Open and repeat with each corner four times. Check each set of folds (4) to be sure no folds were missed. The paper should take on a star-like shape. 7. Push the middle center inward with your fingers forming four points while cupping the star-like shape together in the palm of hand. 8. The four point come together to form a bell. Glue the top three points together, leaving an opening to run a tassel or hanging cord through the middle. 9. Make a small hole in bottom center for tassel or hanging cord. Take crochet thread and wrap it around a piece of cardboard approximately 48 times. The height of the cardboard will measure the length of the tassel. So if the cardboard is three inches tall, the tassel will be three inches long. The quantity of times the thread is wrapped around will determine the thickness of the tassel. Cut a piece of thread about 18" long and make a loop (slip) and place under the wrapped threads. Double loop the thread through, pulling tightly at the top. Remove the wrapped threads from the card and evenly cut the loops at the bottom. Place additional thread at a fingers mark from loop and wrap around several times and tie into a knot. Thread ends into the eye of a needle and pull knot ends and needle down through the center of the tassel to hide the knot. Thread the top tassel cording through the eye of a needle or use wire to run cording through the bottom hole, and up the center and out the top by the points. Glue remaining point and side of bell and string on decorative beads and knot. Smaller versions using 8" scrape book paper. This is really a beautiful, and easy ornament to make for Christmas! It's so beautiful Gail! I love the added tassel detail. What a fun project, and with all the wrapping papers out there the possibilities are really endless. Very pretty! I hadn't thought about how to make a tassel- good tutorial on that too! So gorgeous! My friend Judy taught me how to make these years ago and I had forgotten about them. Thank you for the beautiful reminder! I love these Gail! So beautiful. I pinned them for a Christmas craft day project. I have a feeling they might invade my tree! Cheers. So fun that you teach a crafting class. I bet it's a lot of fun. Love your handmade ornament. This is just beautiful Gail - thanks for a great tutorial - pinning now! This is such a gorgeous ornament. I had to pin before I read the tutorial so I wouldn't forget. I'm definitely going to make these! Thank you. WOnderful and vintage looking. I can picture families in the olden days making these for their tree. The ornaments are beautiful, Gail! Great tutorials. I used to make these with my students to hang around the classroom. Yours are so elegant. Visiting from Say G'Day Saturday - these are so pretty. Pinning. How simply beautiful!!!! 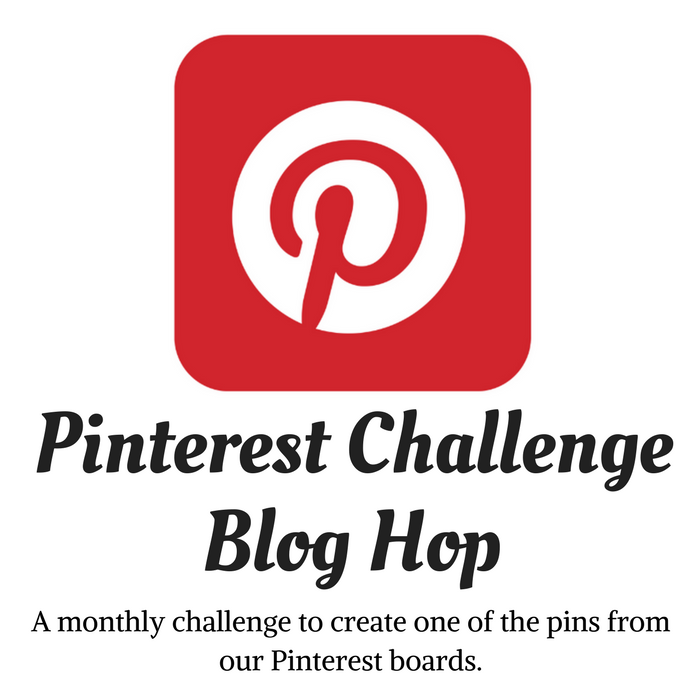 Thanks for linking up with Merry Monday Linky Party!!! Shared your post to Twitter today. So pretty! I love it with the added beads. Thanks so much for sharing at the Make it Monday Party! Hope to see you again next week. 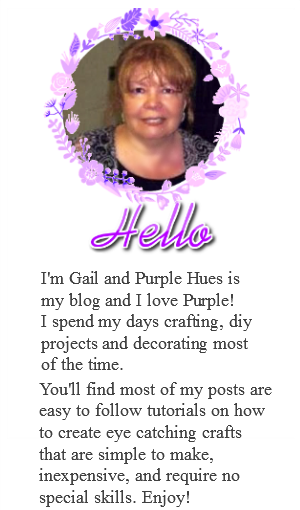 Gorgeous Gail - you come up with the best DIY crafts! What a fun project and I love that tassel. Thanks for linking up to Inspire Me Monday... I'm featuring your ornament this weekend. So cute Gail! You are a crafty soul. Can't wait to see you at the Dollar tree party on December 6th. Pretty. So neat to see how it's made. Thanks for linking up to Show Me Saturday! I love how unique each one is! Such pretty little ornaments. Thank you for sharing at What We Accomplished Wednesdays. Have a great weekend!